November 16th, 2015 - Black Friday, one of the biggest shopping days in the world, will this year offer great deals and price cuts for bargain hunter around Africa. Set to be the first and largest event of its kind in Africa, Jumia, the leading online shopping destination in Africa, introduced Black Friday for the first time to the African market in 2013. “Originally established in the U.S. more than 50 years ago, Black Friday is now a well-known sales day both in the U.S. and Europe. It is however new to the African market and Jumia put great focus on introducing this new sales opportunity to African consumers’, commented Jeremy Doutte, CEO and Managing Director at Jumia Nigeria. In 2014, while more than 100 million Americans were shopping over the Black Friday holiday, millions more were shopping online on Jumia. Last year, Jumia reached an all-peak in sales within 24 hours and had over 1,500,000 online visitors. Over 50% of the visitors accessed the site through a mobile device via Android or iOS. These sales represented a tenfold order increase compared to 2013's Black Friday. “Africa’s disposable income & online consumption is growing at an extraordinary rate. We expect to sell more in this year's Black Friday than in the whole of 2014. But this is just the start. We are here for the long term and have plenty more surprises to come”, added Jeremy Doutte. Last years Black Friday sales showed a great interest in digital products such as flatscreen TVs, digital cameras and ventilation systems. Essentially a marketplace for high-end brands, Jumia has everything from local fashion brands such as Uniwax and St. Geneviève, to established mobile brands such as Infinix, Samsung and Innjoo. 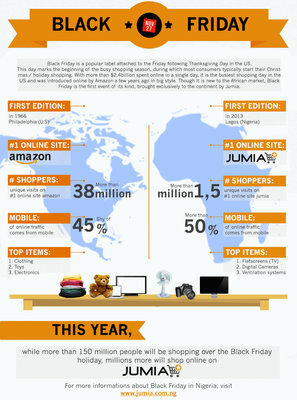 This year, Jumia plans for their Black Friday sale to have a lot more than just large discounts on electronics. Electronics and fashion products take the lead when it comes to sales, but Jumia will offer great deals on cosmetics, home appliances and even children’s toys to its African customers. “By tapping into a global shopping phenomenon, with the support of our partners, we have created a powerful event that our customers will love”, concluded Jeremy Doutte. The Black Friday originated from the U.S. and from the phenomenon that takes place after Thanksgiving day when retailers see a peak in sales. The day became the biggest shopping day of the year with retailers offering discounts and special deals. Now, Black Friday is a global movement and Africans search for the best deals and discounts they would otherwise not get on a regular day.